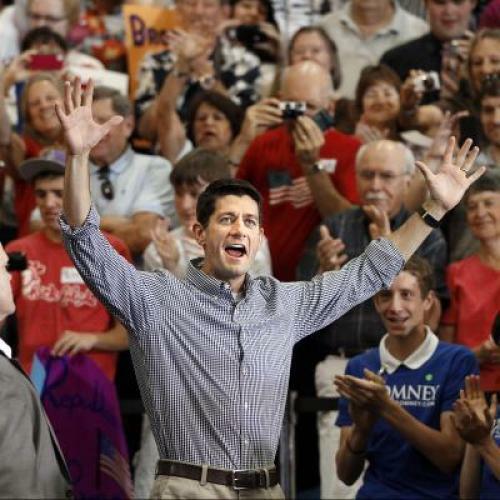 Smells Like Mean Spirit: Is Paul Ryan the Politician That Generation X Deserves? Paul Ryan, who was voted the biggest brownnoser in his high school class, has become the first member of his generation to run on a major party ticket. This, GenX, is what you get if you are too cool to actually, like, do anything. This guy becomes your standard-bearer. You cannot, unfortunately, run for the White House ironically. Ryan is in many ways a fitting figurehead for his age-mates. His personal style, lambasted for its lack of tailoring, clearly was developed during the 1990s: Tell me you haven’t unconsciously searched for a beeper clipped to his khakis. His musical tastes, too, are classic GenX. Rage Against the Machine is his favorite band, even if he’s not their favorite politician. (He is “the embodiment of the machine that our music has been raging against for two decades," according to Tom Morello.) There is even something about the aesthetics of those P90X videos that makes them look like they were only recently liberated from a time capsule packed sometime during the Clinton administration. And it’s not just the surface level stuff. As the Washington Post points out, Ryan is in keeping with the rest of his generation when it comes to his belief that entitlement programs will be around by the time he’s eligible. (Of course, with him, it’s a bit of a chicken-and-nest-egg proposition; does he not believe they’ll be around because he’s confident he’ll be able to slash them?) GenXers aren’t really old enough yet to slip into the conservatism of the dodderingly aged, as they’ll be the first to tell you—these are the people who are writing books about parents who party and coming up with cutesy names for their habit of wearing sneakers everywhere and generally driving up the price of concert tickets—and yet just 20 percent of them still describe themselves as liberal. It makes sense, in a certain way. The big liberal youth movements of the 1990s were disappointing busts. Remember all the fuss over anti-globalization: Where’d that get us? For that matter, given recent headlines and temperatures, where’d all the fuss over the ozone layer or taking back the night get us? The biggest ideological success of the ‘90s has turned out to be the Randian conservatism that Ryan et al marinated in during the Reagan and Clinton years, and have finally brought, half-baked, from the oven to serve up on a gold platter. It’s an economic philosophy that is driven by, in a very different way, the same self-interest and self-regard that was endemic to those GenXers who identified more strongly with Slackers than Dockers. Both mindsets were a response to the early ‘90s recession that many GenXers graduated into, but while those then-twentysomethings were busy staring at either their navels or copies of Atlas Shrugged, the country entered a decade of unparalleled post-war prosperity. So what’d you do with that, GenX? Bought stock in Pets.com and perfected your CD collection? Cooool. So add Paul Ryan—along with the Internet boom/bust, rigorously documented mopey slacking, and I dunno, glowsticks?—to the list of things GenX can count as its legacy. He might not be the politician they want to represent them, but he just might be the politician they deserve.